First off, I’d like to say hi to everyone who came for the Shadow of Night giveaway and stayed for the rest of the blog! I hope you enjoy it. If you haven’t yet, there is still a week left to enter the giveaway. Just go to the previous post and leave a comment! Today we have a nice progression of books from one about a tea shop in Charleston, to one in which tea is a mainstay of the steampunk heroine’s life, to one with a steampunk pirate. Two have tea, two have air ships. Only one has mummies though! There should be more mummies. Speaking of which, The Mummy Congress by Heather Pringle is totally awesome if you’re excessively interested in mummies, which I am. I am also, you may have noticed, a little hyper today. I went to see the Avengers Thursday night and I’m still a bit sleep deprived and loopy. So please, bear with me. My year of 100 books is progressing. I just finished #30 so I’m a little behind, but nothing I can’t make up. I hope. Now, on to the three books we’ll talk about this week. 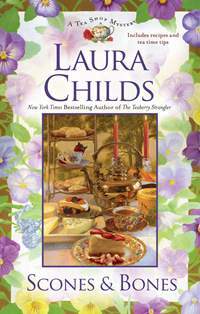 This is the twelfth book in the Tea Shop Mysteries series. These are definitely on the cozy side of the mystery world. The protagonist, Theodosia Browning, is the proprietress of the Indigo Tea Shop in Charleston, S.C. She is also a bit of an amateur detective. Theodosia is amply aided by her staff at the tea shop; Drayton, a master tea blender and history buff; and Hayley, the shop’s chef. Theo also has a dog named Earl Grey who isn’t vital to the story, I just like him. In this story Theodosia and Drayton are attending the opening of the Historical Society’s new exhibit on pirates when the prize of the exhibit is stolen and a volunteer is murdered. The president of the historical society comes to Theo and begs for her help solving they mystery and recovering the lost artifact. Of course, this artifact isn’t the sort of thing you can pawn on any corner. The missing treasure is a silver skull cup. The skull is rumored to be that of Edward Teach, aka, Blackbeard. Theodosia soon discoveries that not only is the cup valuable on its own, but it supposedly is one of three clues that can lead to Blackbeard’s missing treasure, more than enough motive for murder. I enjoy this series. It’s not terribly deep, but I find the characters convincing and interesting. The tiny details about Charleston delight me. It’s a city I have never visited, but I’d like to someday. Childs also knows her tea. She talks about the different blends and flavors and includes recipes in the back. I’ve tried several of them, including the earl grey truffles. Theo is an intelligent woman. She occasionally makes stupid, yet plot driven decisions, but I don’t find myself yelling at the book in an attempt to get her to make different choices, so I’m going to call it a win! The mystery itself is pretty good. In long running series there’s always a temptation to just make the killer the first new person you meet. Childs manages to avoid this pitfall. I’m not going to say that it’s a complete stumper. You can guess, but she doesn’t just give it away. All of my books this week are part of a series. 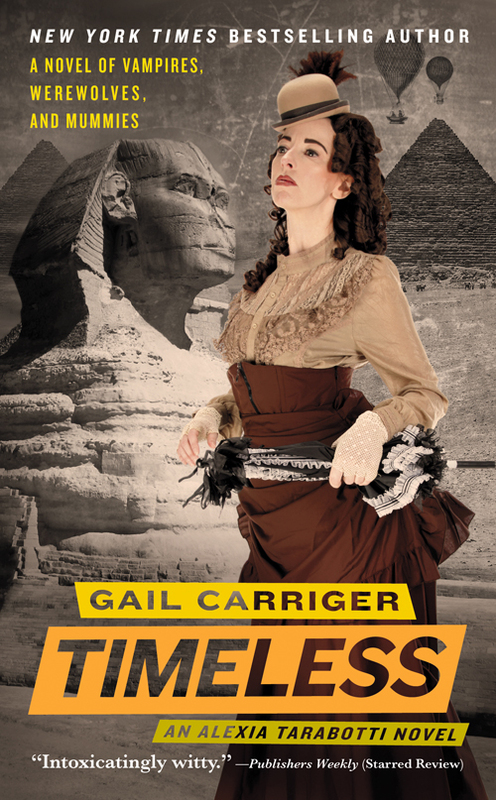 Timeless is the fifth and final book in the Parasol Protectorate series. The heroine, Alexia Tarabotti Macon is what is known as a preternatural. She has no soul. This is not as inconvenient as one might think. In her world there are those with no soul, those with just the right amount of soul, and those with excess soul. The people with excess soul have the potential to become supernatural. They may become ghosts when they die, or they may survive the transition into vampires or werewolves. The preternaturals are the opposite of the supernaturals. They can cancel out the supernatural and render ghosts permanently dead or return vampires and werewolves to their human state with a touch. All well and good. However, over the course of the series Alexia has found herself married to a werewolf, Conal Macon. They now have a daughter together with a unique blend of her parents’ attributes. As I understand it, Prudence will soon have her own series of books! Alexia and her daughter find themselves summoned to Egypt at the behest of the Alexandria hive’s Queen. As the oldest known vampire her requests are not lightly ignored. The small family teams up with Alexia’s great friend Ivy Tunstell (who I dressed as for last year’s DragonCon) and her theater troupe. Alexia suspects that her daughter’s unique attributes might be the reason the Queen has requested their presence. This book makes me ridiculously happy for several reasons. #1 – I love the Parasol Protectorate series so more of it is always better. #2 – I love Egypt so I’m always happy to see books set there. #3 – I have always felt that Alexia is the spiritual daughter of another great parasol toting heroine – Amelia Peabody from Elizabeth Peter’s book series. They are both wonderful, adventurous, intelligent women. Amelia is an archaeologist who works in Victorian Egypt so it is very exciting for me to see Alexia go to Egypt! If you have any interest in murder mysteries or Egyptology I highly recommend those books. This is book #2 in the Iron Seas series. I reviewed book 1 The Iron Duke last time. Sadly, this is another pretty terrible cover. I’m not sure why he’s moist… from the steam? Also, if you look closely, I”m pretty sure the model is wearing cargo pants. So there’s that. But! The book itself is awesome, just like last time. 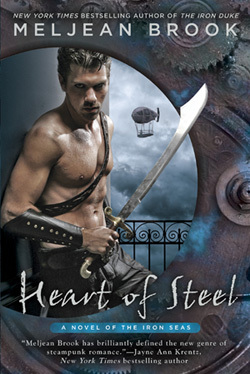 Heart of Steel focuses on Yasmeen, the captain of the Lady Corsair. We get a lot of her back story and find out lots of details about where she came from, as well as finding out more about the Horde. InThe Iron Duke Yasmeen throws the adventurer, Archimedes Fox, off her ship and into a canal in zombie infested Venice. Heart of Steelopens with her going to tell his sister about his death and promise her a fair portion of the treasure he found. That’s when things start going wrong. It’s around page 5. First of all, people already seem to know about the treasure. And they very much want to take it from her. Shortly after that, Yasmeen discovers that Archimedes is still alive. He has come to retrieve his treasure and make one more run at capturing Yasmeen’s affections. He succeeds in getting her attention, which may or may not be a good thing for him. The others who pursue the treasure are hot on their heels though. Very quickly, they find themselves without a ship or crew. They join a French expedition run by a Horde diplomat. This puts both Yasmeen, with her hidden past, and Archimedes, with his outstanding debts, into a very delicate position. There are zombies, treasure hunts, narrow escapes, and rebellions. I really don’t know what more I could have asked for in this book. There is a bit more of a heated romance in this one. I’m not sure if it’s because Yasmeen is comfortable with herself in a way that Mina from book 1 just couldn’t be, or if it just worked out that way, but the steam isn’t just coming from the clockworks in this book. Great blog. Wonderful reading information and interesting! Wonderful blog! A real find for me with great recommendations and interesting reviews and information.